Now that Captain America: Civil War has finally hit theaters, the next big Marvel Cinematic Universe team-up will be the biggest one to date: Avengers: Infinity War – Part 1. This conflict will see Earth’s mightiest heroes take on Josh Brolin's Mad Titan, Thanos – who has finally gotten his hands on his beloved Infinity Gauntlet. However, The Avengers won’t be the only heroes to square off against Thanos when he finally arrives on our home world. The creative forces behind Infinity War have recently come out and explained that it only makes sense for Star-Lord and his band of Guardians of the Galaxy to show up and lend a hand. Let’s put it this way: you know who owns that [Infinity] Gauntlet, right? And you know who’s in another movie, and his kids are in that movie…you do the math! That math really is hard to argue with at this stage of the game. With Thanos’ adopted daughter Gamora taking on a full time gig as a member of the Guardians of the Galaxy, it would seem incredibly odd for her not to show up and face off against the Mad Titan in some capacity. Thanos’ biggest role in the Marvel Cinematic Universe to date has been his stint in Guardians of the Galaxy when he was shown pulling the strings behind Ronan the Accuser’s dastardly plot. 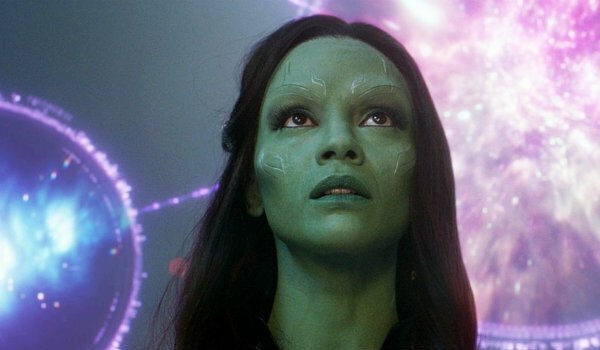 That particular movie set-up Thanos' larger role as an antagonist against the Guardians further down the line, so if Gamora wants her revenge, she may have to fly to Earth to get it. Gamora isn’t the only member of the Guardians of the Galaxy who has a serious bone to pick with Thanos either. The entire reason Drax the Destroyer joined onto the team was to take down Ronan, but by the time that movie had ended he realized that the only way to get true revenge would be to take down Thanos himself. Drax actually managed to kill Thanos in the comic books at one point, so the Guardians could potentially play a major role in taking down the Mad Titan during the events of Infinity War. The Guardians of the Galaxy have remained suspiciously absent from the Marvel movie canon ever since their first solo outing in 2014. The last few MCU adventures have set the stage for some major Phase 3 shakeups, but their corner of the cosmic realm has remained decidedly quiet. With Thanos about to attack Earth and "court Death," it’s looking more and more like Peter Quill is going to finally return to his home planet to provide some much needed reinforcements with his team of intergalactic misfits and criminals. We will keep you up to date regarding all of the upcoming Marvel movies as information becomes available to us. Guardians of the Galaxy Vol. 2 will hit theaters next year on May 5, while Avengers: Infinity War – Part 1 will premiere the following year on May 4, 2018.